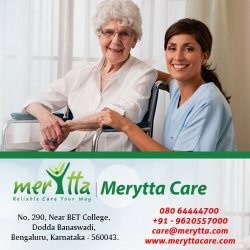 Welcome To Merytta Care - Have A Reliable Care Your Way. Everything feels better with good care at home, we offer best possible care to help people to have a comfortable life at home with independence and dignity, we support them to maintain their chosen lifestyle. Address: No. 290, Near BET College, Dodda Banaswadi, Bangalore – 560043.